William Shatner & Roger Corman Two Legends On One Stage At Comic-Con! Based on Shatner’s hugely popular book, this film examines the mystery, longevity and the cultural phenomena of Star Trek and its long-obsessed fans known as “Trekkers.” On the surface, the film is an exploration of strangers who have for years attended conventions which looked foolish and almost laughable to some – but Shatner discovers the many secrets and hidden motives behind these individuals’ compulsion to attend these events. 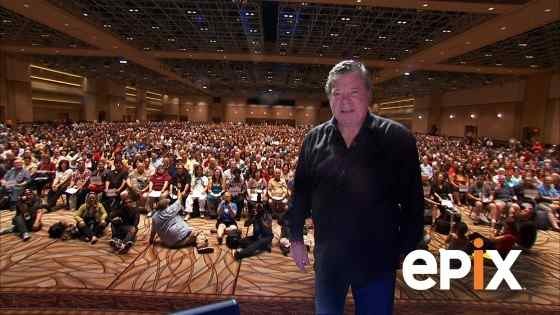 The end result is a film that reveals a fun and touching side of the fanfare surrounding Star Trek, and examines the thrill of what’s happening at these fantasy conventions and the enduring popularity of the film and TV series as Shatner further embraces his role as Captain James T. Kirk and his own impact. Posted on June 20, 2012 Author Anthony DavisCategories Movies, News, Press ReleaseTags 3D, Attack of the 50ft Cheerleader, Comic-Con, EPIX, Get A Life, KEVIN SMITH, Panel, ROGER CORMAN, WILLIAM SHATNERLeave a comment on William Shatner & Roger Corman Two Legends On One Stage At Comic-Con!